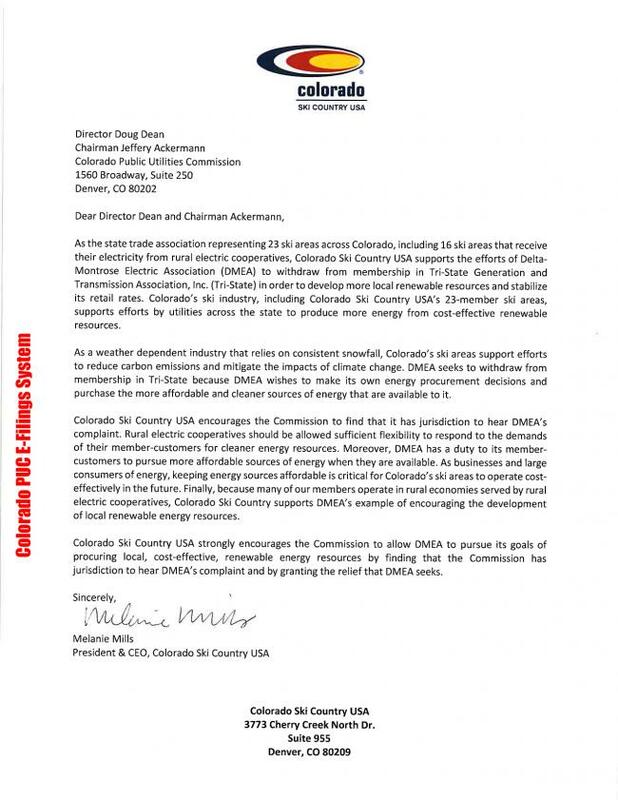 COLORADO SKI COUNTRY USA DECLARES SUPPORT FOR DMEA | Delta-Montrose Electric Assn. FEBRUARY 6, 2019 - Colorado Ski USA has officially announced its support of DMEA's filing with the Colorado Public Utilities commission to extract a just, reasonable, and non-discriminatory exit charge from Tri-State. "Colorado Ski Country USA encourages the Commission to find that is has jurisdiction to hear DMEA's complaint. Rural electric cooperatives should be allowed sufficient flexibility to respond to the demands of their member-customers for cleaner energy resources."